Finding hospice care for your loved one can be very challenging. You want to find a caregiver who will provide the very best, but your standards are expectedly very high, and you have a hard time trusting that anyone else can do as good a job as you for your loved one. Yet you also don’t have the time or the energy to devote to all that your loved one needs — or, sometimes, even to the search for another caregiver. American Hospice and Palliative Care makes it easy by providing the very best care for the end of your loved one’s life. You have many choices for hospice care in Phoenix, but we have built a reputation for being among the best thanks to our high-quality facilities and our dedicated team of providers. When your loved one cannot spend their final days at home, the next best place is somewhere designed to be just like home. That’s what American Hospice and Palliative Care provides. Our Villa has private rooms for residents that are designed to be as comfortable as possible. They look like private bedrooms rather than hospital or clinic rooms, and patients can have personal belongings there that make them look more like home. Outside the rooms, the Villa includes a professional kitchen, private courtyard, quiet chapel and other features that make patient stays more comfortable. We also offer guest rooms for visitors who would like to stay overnight. Our facilities are designed to put patients and their families at ease. We may not be able to change the medical prognosis that your loved one faces, but we can change the way your loved one lives those final days and the quality of the experience for you and your family. Our staff is the heart of our operation, and their dedication and commitment is obvious in everything they do. They provide compassionate and conscientious care for both patients and their family members. Our Interdisciplinary Group includes a physician and nurses, as well as a support team that includes hospice aides, social workers, counselors and volunteers. We also have a bereavement team that is dedicated to helping patients and their families through the grieving process. American Hospice and Palliative Care is guided by the Ethical and Religious Directives for Catholic Health Care Services, though we do not proselytize or exclude patients of other faiths. Our spiritual counselor ministers to patients whatever their religious beliefs and provides the spiritual support and guidance that they need. We have built a reputation throughout Phoenix for the high quality of our care thanks to our dedicated team. Our facility is licensed and Medicare certified, and our operations are owned and overseen by a family of registered nurses. We have high patient satisfaction ratings, and we are committed to continually improving the quality of our services. Call us today to learn more about our hospice care services for patients in Phoenix and the surrounding area. 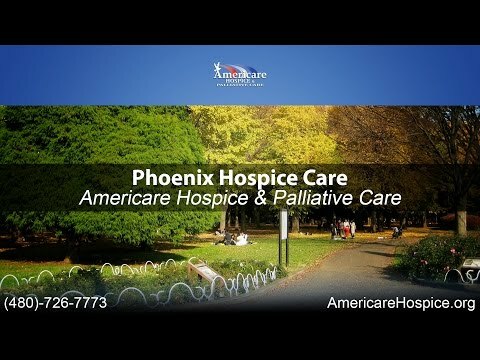 For hospice care in the West Phoenix areas of 85201, 85209, and 85051, as well as the Dreamy Draw areas of 85020 and 85028, Americare Hospice and Palliative care can help. When you need compassionate care for your loved ones in the North Phoenix areas of Desert Ridge in 85050, and 85054, as well as the Deer Valley areas of 85027, 85204, come to Americare Hospice. For help with your love ones and their failing health, trust Americare hospice to help in the Central Phoenix areas of Camelback and Arcadia in 85018, 85016, 85014, and 85015.